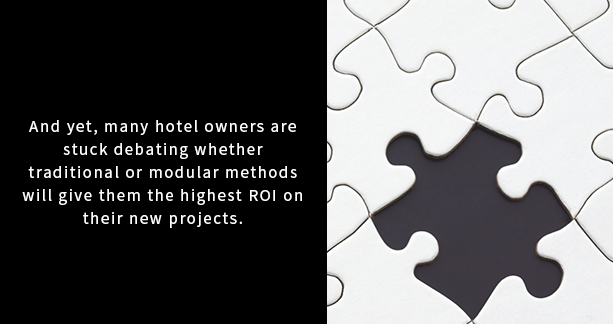 Heavy-hitting hoteliers (Marriott, Hilton, and IHG) are actively embracing modular construction, noting the method’s higher quality and more expedient construction. Some even offer financial support to developers for design initiatives that adopt the construction method. For every modular fairytale, we’ve heard stories fraught with challenges. While the perks are many, modular construction is indeed a different animal in terms of scheduling, logistics, and the roles of key players throughout the process. That’s why we’re unsurprised when thoughtful hotel owners approach modular opportunities with excitement—and a healthy dose of skepticism. So what’s it really take to reap the numerous benefits of modular construction while skirting its hurdles? We’re glad you asked. 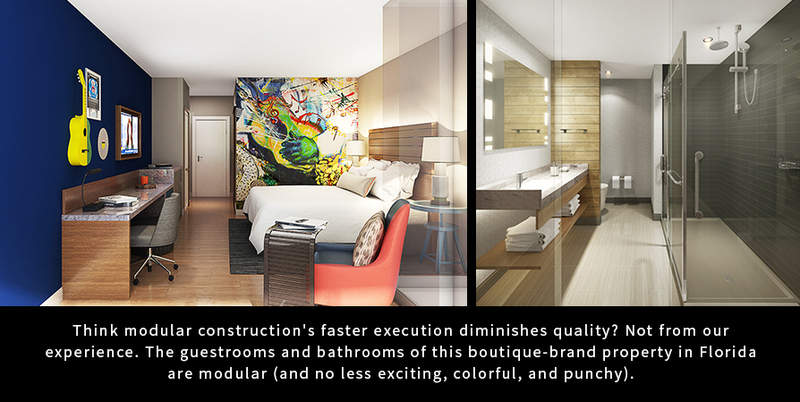 Project Designer Jason Moore has learned a thing or two—or 100—about the nuances of modular construction across three different projects: a branded-boutique property in Florida and a dual-brand and focused-service hotel, both in New York. Why? Building units called “pods” or “modules” are fabricated offsite in lab-like, climate-controlled facilities that churn out precisely-designed products—each one an exact replica of the other, adhering to strict brand and regulatory standards. It’s basically an à la carte menu packed with dynamic variations of brand-approved guestrooms, bathrooms, exterior canopies, and porte cocheres. Made to travel and independently engineered, these pods offer increased durability and fewer defects. Another bonus? Factors that can adversely affect traditional construction projects such as materials scarcity, skilled labor shortages, and weather conditions are circumvented. These prefab systems’ set dimensions lend themselves to orthogonal aesthetics—making them inefficient for small-scale buildings, properties with unconventional footprints, and hotels with uniquely-shaped sites. But it’s not all or nothing with modular. For the project we’re working on in Florida, a mix of prefabricated-structural systems and onsite-built structures allowed for a more organic flow throughout the building. A seasoned team can help owners craft hybrid approaches if a clear design vision is in place. Often, modular mishaps occur because of poor up-front planning and timing. “On one project, we had a new modular component added after preliminary floorplans were developed,” explains Interior Designer Erin Brunner. As an important piece of the overall footprint, the addition necessitated a complete overhaul of the design and associated documentation. In the case of modular projects, each system and associated manufacturer is unique—with its own personnel, logistics, and billing schedules to make sense of. What do these revised roles and scopes look like? What’s the process for building and shipping the pods as they relate to a specific project site? Think of modular construction like the first big shoot day on a movie set, with a whole crew of technicians coming together for the first time. Collaboration and role clarity are key to keeping the production on track. Who makes sure each actor’s hair is just right? Is it hair and makeup personnel or the line producer who’s actively looking for consistency issues between takes? Maybe both? Consultants rely on us as design team leaders to set the whole production up for success, which is why we create a responsibility matrix for all our projects that defines who is doing what, and when. For modular projects, this matrix is critical. Working with pods without embedded mechanical, electrical, and plumbing components? Yep; we’ve seen it. Overlapping structural engineering consultants (some manufacturers have their own)? We’ve navigated it. “It’s on our shoulders as the architect to keep the whole team aligned and moving,” says Michael Harper, another project designer with modular expertise in our hospitality studio. The “when” of modular is a driving piece of that puzzle. Actual construction of the individual pods doesn’t occur until after shop drawings are finalized, so all disciplines must align to complete refinement requests within a specified window. Any design changes beyond this point are costly (in both time and money) because custom modifications to these pods are considered additional services. Miss that window, and the project loses its place in line with the manufacturer … and the project misses its delivery deadline—another logistical hurdle. Because pod manufacturing is still in its infancy in the United States, there are far fewer facilities to work with, so options are limited and might not be near the construction site. For our New York projects, pods were built and shipped from Florida. To meet the delivery deadline, we worked backward from our clients’ established project completion dates, navigating shipping costs, transportation timelines, and load restrictions; a single 18-wheeler can only carry three to four pods at a time. 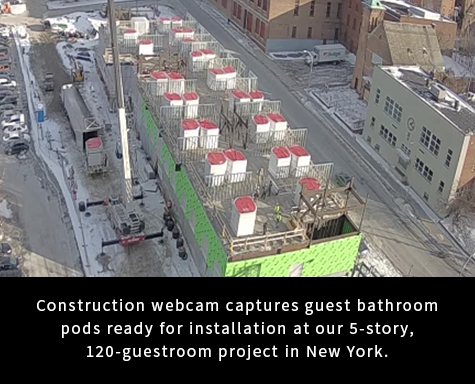 Once the pods arrive on-site, however, construction moves quickly. The benefits of modular are clear, and it’s steadily becoming more popular—because it works. Higher quality, increased efficiency, and precision construction are compelling considerations for any developer. “With every new modular project we take on, we work smarter and faster,” says Terri. “I don’t think this is a fad, it’s an exciting future that’s reshaping our roles as designers.” Through use of modular elements designers are really able to focus on those distinct, custom moments that set one hotel apart from another—all without compromising on performance or schedule.